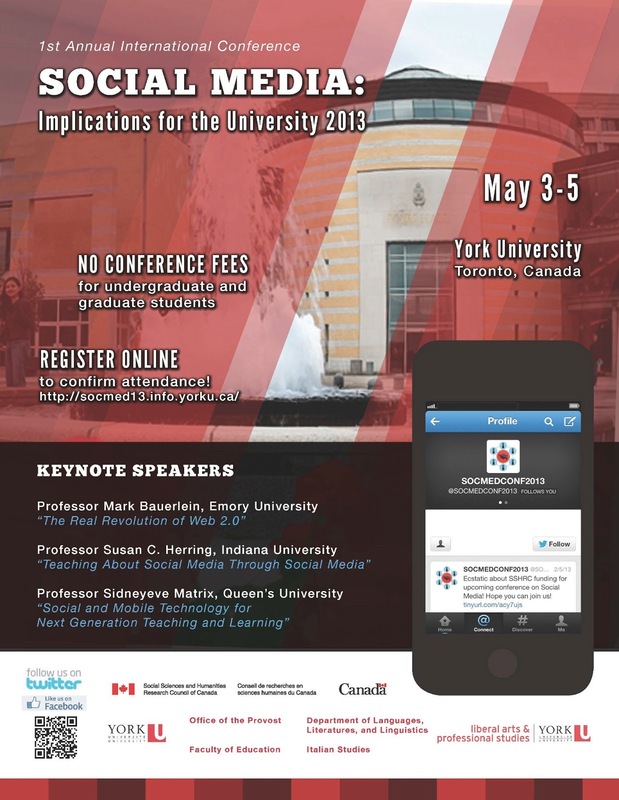 Last month (May 3-5), my colleague, Dr. Jackie Kirk and I attended the first annual Social Media: Implications for the University conference held at York University in Toronto. The conference was not large, however it was amazing in the diversity of presentations and fairly unique in the format. The presentations covered areas of administration and recruiting, research on using social media for a variety of purposes in the university, and a few sessions offering a critical look as well. The format was unique in that each day had a keynote address of about an hour in duration, and sessions were about 20 minutes with 10 minutes or so for questions and discussion. This kept the presentations moving and concise and interesting discussion. The other interesting piece of the format was that there were no concurrent sessions, ALL participants sat in and listened to all presentations. Ths worked very well, in my opinion, since I heard several sessions that I might not have chosen to go to, yet was glad that I did indeed hear them. This gave a broader perspective of the use of social media in areas such as recruitment & retention, sociology, drama, archaeology, and more. It also allowed for the participants and presenters to get to know one another. I made several contacts, interestingly, by conversing on the twitter backchannel then having lunch together! I came away with some new insights and ideas and was able to make some great new friends and contacts as a result. 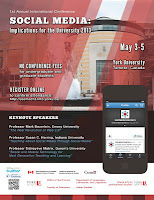 I commend the organizers, Roberta Iannacito-Provenzano and Jana Vizmuller-Zocco of York U., for their hard work on a successful conference. For our part, Jackie & I presented on "Student Engagement Using Social Media in Teacher Education". The slides we used are below, we took a contextual and story based approach, and I believe our session was well received based on the comments and discussion afterwards. Oh ... the other great thing about the conference was that the weather was beautiful, a big difference form the continuing snow and cold weather in Manitoba!